Any self respecting geek gets a virtual stiffy for space combat. Whether it's piloting your ship against Kilrathi scum in Wing Commander, or taking control of an entire fleet in Homeworld - space combat makes our geek libido tick. It's been ten years since the aforementioned Homeworld was released by Relic, a space RTS on a grand scale, complete with gorgeous graphics and addicting gameplay. 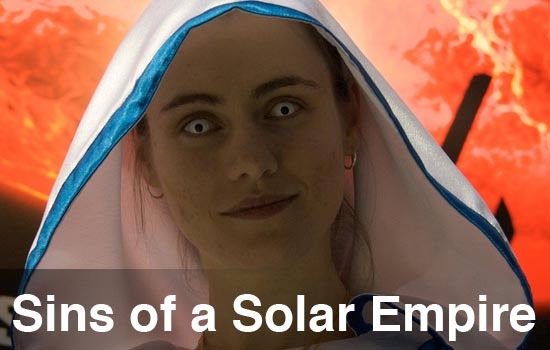 Fast forward to 2008 and a company named Ironclad Games released a title named Sins of a Solar Empire. It's a game that promises not only grand space combat on an epic scale, but strategy like no other as players can micromanage the details of economy, production, and research. But your galaxy is a big empty and lonely place, one that's best filled with friends, thankfully Sins doesn't disappoint with it's cooperative mode. 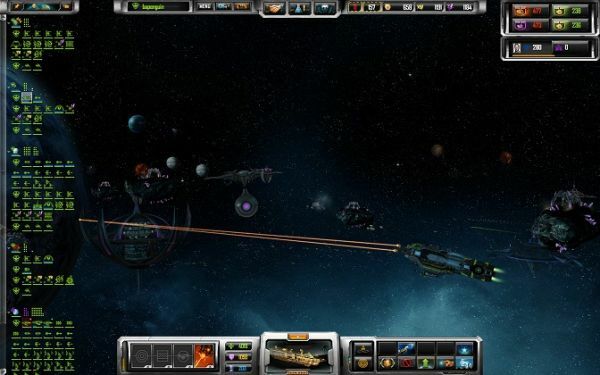 Sins of a Solar Empire isn't a strategy game for the faint of heart, and it's not a strategy game for someone that doesn't have a lot of time on their hands. A simple 1 vs 1 match can last for 4 or 5 hours. The screen is overloaded with information; collapsible panels, dialog notifications, menus and sub-menus all make your monitor look like a display in an intergalactic battle. As overbearing as it is at first glance, it really just works. I felt completely comfortable with it after just two missions. The game's tutorial does an excellent job of giving you the basics, and it doesn't take long to fill in the blanks. When you start a scenario in Sins, you are given a home planet and a some basic essentials. From here you'll mine metal and crystal to bring in income. This is turn is used to build ships, research facilities, and even upgrades on the planet's surface. You can spend time researching civic upgrades to bring in gold faster, mine crystal and metal more effeciently, or have better trained spaceship crews. Or you could research military upgrades for weapons, new ship types, and defensive upgrades. It won't be long till you've maxed out your slots for your planet upgrades and structures and it's time to jump to a nearby planet and pursue colonization. Sins doesn't have a campaign, but rather is a collection of scenarios ranging in sizes from 2 players to 8 players. These scenarios are available in cooperative mode with human or AI players, each of which has adjustable difficulty as well as the ability to choose from one of the game's three races. As I mentioned earlier, matches in Sins of a Solar Empire take quite some time to work through. Thankfully the game supports a robust save system that not only allows you to save co-op games; but the save system allows you to load up the save and bring in other co-op players if your original crew isn't available. Page created in 0.5339 seconds.